NEW YORK, Mar. 24, CMC – The New York-based Jamaican hospitality group, Team Jamaica Bickle (TJB), will be honoring former Jamaican Prime Minister Portia Simpson-Miller and others during the group’s 25th anniversary reception to be held in Kingston, Jamaica on April 1. TJB – which provides hospitality support for Jamaican and other Caribbean athletes who compete at the annual Penn Relays Carnival at the University of Pennsylvania in Philadelphia – said on Saturday that the honor ceremony will be held under the patronage of the Governor General of Jamaica, Sir Patrick Allen. Rounding out the list of honorees are Dr. Walton Small, Jamaica Inter-Secondary School Sports Association (ISSA) president; Ali McNab, former sportscaster and currently special advisor, Ministry of Culture, Gender, Entertainment & Sports in Jamaica; Sekou Clarke, Jamaican immigration attorney; and Trishana McGowan, Jamaican sports analyst and former athlete. TJB said Simpson-Miller is “heralded as a standard bearer for women. 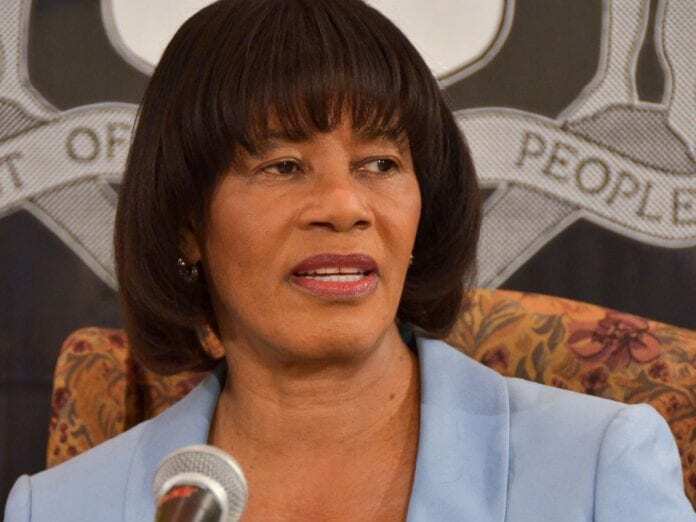 “She became Jamaica’s seventh prime minister in March 2006 and was conferred with the Order of the Nation in May 2006,” it said. “Mrs. Simpson Miller’s ascension to Jamaica’s highest political office came after having served for 17 years as a Cabinet Minister. “Her distinguished record of service at the regional and international levels deserves much acclaim,” TJB added. It said Wehby rose to prominence in the Grace Kennedy Group, serving in various capacities within the organization before being appointed chief executive officer in 2011. “His extensive professional background spans both the private and public sectors, where he continues to hold various leadership positions,” it said. Wehby is currently New Zealand’s Honorary Consul to Jamaica, following his appointment in September 2015. “As the number grew through the years, the contingent of athletes and administrative staff has surpassed over 600 at its peak, with groups coming from Trinidad & Tobago, Guyana, and St. Vincent & the Grenadines, the USA, among others,” TJB said. Through TJB’s partnership with the Bronx, New York-based Caribbean Food Delights, athletes are provided with three hot meals daily, ground transportation, chiropractic and some medical services and mentorship. TJB said it initiated partnerships with Jamaican companies to the Penn Relays 25 years ago, resulting in Grace Foods becoming title sponsor of the Relays Carnival for subsequent consecutive years. In 1999, TJB became the first Jamaican organization to be a participating sponsor at the Penn Relays. “As a result, the Jamaican flag became the first foreign-nation’s flag to be flown at the Penn Relays, a distinction unmatched,” TJB said.